This image of Christine is one of my favorites of her getting ready. She got ready at the Foundry Suites in Buffalo. That is also where Christine and Ron had their wedding reception. The ceremony was at St. Adalberts Basilica in Buffalo. They were the last bride and groom to get married in this Polish Basilica before it closed. Family members had been married there, so it was so special for them to be able to have their ceremony there. The rooms at the Foundry are so nice for wedding parties to get ready. The rooms are really big and have giant windows with great lighting. Christine was so outgoing when we first walked in. She made us feel like we have all been friends for a really long time. After she got into her stunning wedding dress we wanted to do some fun and creative portraits for her. There was a nice big mirror we were able to move around in the room. 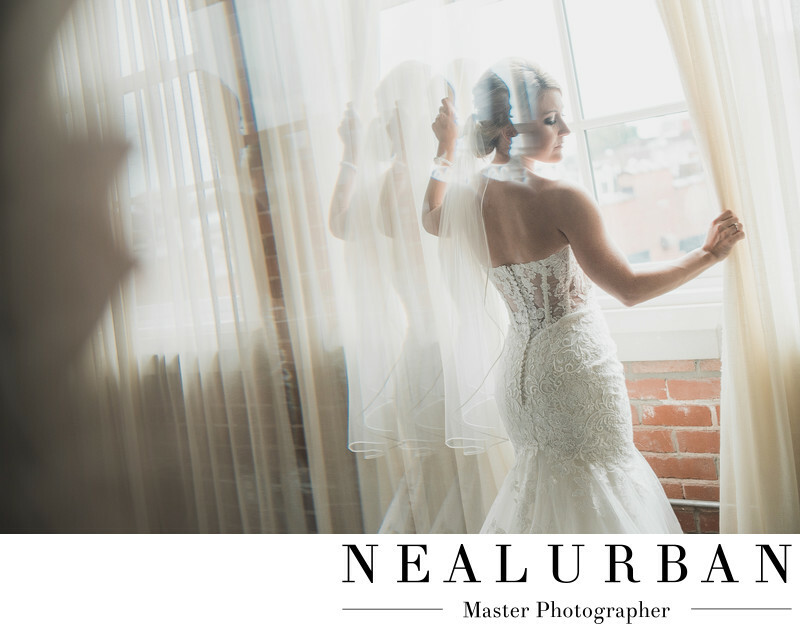 We wanted to get some reflections of the bride at the window. We had her pull the curtains away a little to let some natural light in then look down toward her shoulder. After moving the mirror around a little, this was the reflection we got! We loved it! At the same time Neal was doing this, I was taking images of the bride straight on getting some up close details of makeup. This is one great thing about having both of us as main photographers. We can really move around and take images without being told to from the other person. We like to take different angles and styles. We move around a lot and may see things the other doesn't. We are always in contact and talking to each other too! Having great communication helps us create amazing images for our clients! Location: 1738 Elmwood Ave Buffalo NY 14207.